In 1916 Old South Meeting House launched a popular forum featuring diverse speakers and public discussions of contemporary issues. As in pre-Revolutionary times, the Meeting House rang with democratic fervor and new ideas. But by the 1920’s, the nation struggled with issues of the right to free speech. In Boston mayors James Michael Curley and Malcolm Nichols and an influential group called the Watch and Ward Society repeatedly banned controversial speakers, books and plays. Speakers such as Communist Anthony Bimba, birth control advocate Margaret Sanger and supporters of anarchists Sacco and Vanzetti were banned from speaking in Boston. During this time Old South Meeting House hosted increasingly controversial events. The Board of Managers were divided over how far free speech at Old South Meeting House should go: some favored meetings that were purely “educational" or "charitable", while others believed that Old South’s revolutionary history mandated a strong free-speech, anti-censorship policy. In 1929 the issue of free speech at Old South Meeting House reached a boiling point when Eugene O’Neill’s play Strange Interlude. was banned in Boston. A major forum protesting the ban took place at Old South Meeting House. But some board members felt it went too far. The board held a special meeting to decide Old South’s free speech policy. After much discussion, they voted to open the doors of Old South Meeting House to speakers and public discussion “without regard to the unpopularity of any cause.” Old South Meeting House took its stand at a time when the U.S. Supreme Court and many Americans were wrestling with the idea of free speech. The building’s role as a public meeting place, often for radical causes, was once again an important function just as it had been in the colonial era. Upholding its mission as a platform for free and unfettered speech, the Old South Meeting House embodies the American tradition of civic discussion. The sharing of ideas, though often contentious, is the lifeline of our democratic society. 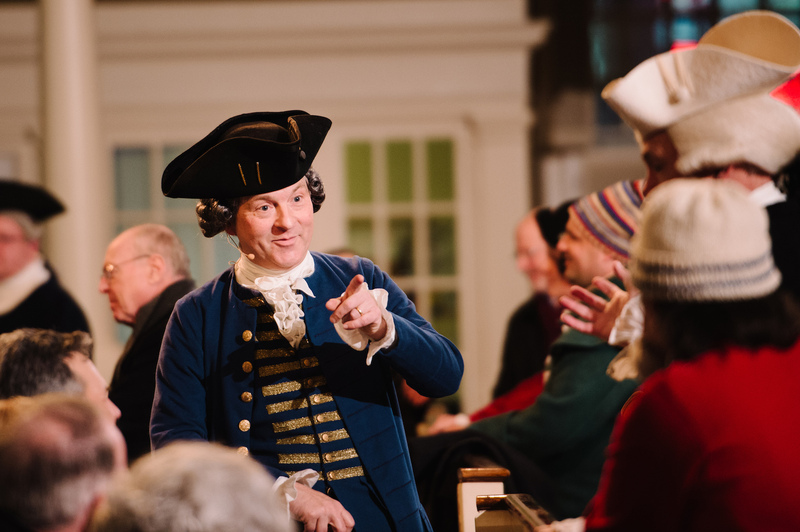 Today the Old South Meeting House still hosts spirited, thought-provoking events, and is committed to presenting topics and speakers regardless of their unpopularity or controversy.